This was actually Ben's bento from last Wednesday, which was also the day that Faith got her arm cast off and the pins taken out of her foot. I was busy trying to get her ready for her appointment when I realized I needed something for Benjamin. 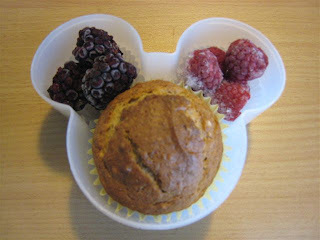 We quickly threw together a batch of banana muffins (because muffins cook more quickly than bread) and raided our freezer stash for some berries. Ben had one of the muffins and some frozen raspberries & blueberries, which I assume were no longer frozen when snack time rolled around. The warm muffin might have helped defrost them.